Baluarte Bicentennial Bridge, the world’s tallest suspension bridge, was opened in Mexico Thursday, spanning a ravine higher than New York’s Empire State building and Paris’ Eiffel Tower. 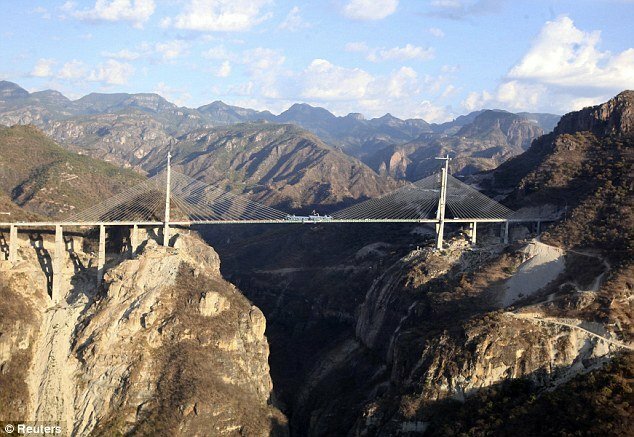 Baluarte Bicentennial Bridge is 403 meters or 1,322 feet tall and connects between the northwestern states of Sinaloa and Durango in the Sierra Madre Occidental mountains. Officials with the Guinness Book of World Records were present as was President Felipe Calderon for the opening ceremony. The world’s tallest bridge features four highway lanes celebrated for cutting transportation time between the two regions by an estimated six hours. Without including the Empire State Building’s lightning rod, the bridge can easily fit its towering height from head to toe or the height of Paris’ Eiffel Tower which stands at 324 meters or 1063 feet. After four years of construction, the Baluarte Bicentennial Bridge is priced at 2.18 billion pesos or 158.98522 million U.S. dollars. The bridge is so named as the country celebrates it’s bicentennial independence from Spain which was in 1810. The Durango-Mazatlan highway newly constructed to reach the bridge cost its own amount of over 20 billion pesos or 1.45858 billion U.S. dollars. It had been deemed President Felipe Calderon’s most significant transportation project during his six-year term according to the country’s transportation ministry. “With developments in infrastructure, we’ll continue to achieve the targets established during my term,” President Felipe Calderon said Thursday according to TheAge.com.